More than just a book of patterns, Folk Socks opens with a useful series of concise articles on the history of stockings, beginning with ancient examples made with cloth or leather, the transition to naalbinding and then knitting, the growth of the stocking as fashion accessory, and the transition from hand to machine production. There are also brief sections on knitting tools and knitted stocking traditions in countries throughout Europe. This is one of the best short accounts I’ve seen. Nancy Bush knows her stuff and how to present info in an interesting way. She also provides a good tutorial of the “anatomy” of socks and the various techniques used to knit the individual parts, including “clock” designs. The rest of the volume contains patterns designed to represent traditional socks/stockings from 18 different countries. These patterns are beautiful, but many are quite complex, requiring sophisticated knitting skills and experience. I would be able to make most of them, and if planning to use them for display purposes, might give them a try. All but a few would be very time consuming to produce, however, and nice as they are to admire, I’d never wear them. I enjoyed reading Folk Socks, and have referred back to it many times in my work as amateur textile historian. An updated edition of this book is now available. Oh no! That beautiful cabled sweater you worked so hard on has a hole in it! No worries. It is possible to make repairs using this article from Interweave Knits . Appears to be a technique similar to closing the toe of a sock using Kitchener stitch. The article also includes helpful suggestions for finding the right yarn for the repair if you no longer have any that the item was made with. Knitting News: Olympic Coach Keeps Calm by …..Knitting?!! How cool 😎 is Finnish snowboard coach Antti Koskinen, a man who has discovered for himself one of the perks of knitting !? This shot was taken yesterday while the coach was awaiting the run of team member Roope Tonteri in the slopestyle event. Now the news is going viral on Twitter, everyone wanting to know what Mr. Koskinen is making. According to the Olympic Team Finland, Finnish President Sauli Niinistö and his wife Jenni Haukio announced the birth of their son at the beginning of February, so the team is now knitting up squares for a blanket to welcome the baby. What a special gift, you’ve gotta love 💕 it! A study published in the British Journal of Occupational Therapy found that there is a “significant relationship between knitting frequency and feeling calm and happy. More frequent knitters also reported higher cognitive functioning.” Knitting for the gold? Unfortunately, no, but racer Enni Rukajärvi did win a bronze. The blend of textures and colors in this cozy afghan make it a perfect fall or winter project, its variations offering much more interest than one that is uniform throughout. And, once it games no some size, it’ll keep you cozy while working. The yarns are from Bernat and a size 8(US) 36 inch circular needle is suggested. The pattern is accessible free of charge from Yarnspirations. Yes, it’s true. 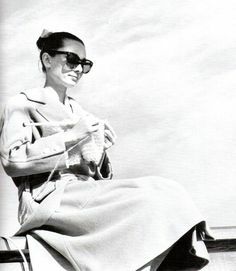 The lovely, elegant Audrey Hepburn was a knitter just like us. This photo was taken on the set of The Unforgiven, in 1960. And who could forget this scene with George Peppard in Breakfast at Tiffany’s? One more reason to be just like Audrey! While hopping about on the web this week, I’ve discovered several cute, traditional Christmas patterns, and thought it’d be helpful to list them in one place. Cute as package decor or on the tree. Just in case you didn’t have enough to do this week! Click on the word pattern to access each. Knitting News: Is That a Scarf Tied Around That Tree? No, it’s not a yellow ribbon, it’s probably not even yellow. Neither is it another form of yarn bombing, which is sort of wasteful when you think about it. Rather, there’s a new trend spreading across the country. People are tying scarves, handmade or store bought, around trees is urban areas, parks, and neighborhoods. They’re labelled with messages like, “No, I’m not lost. Please take me with you if you’re cold. Hope it helps.” Since the trend started in Seymour,Indiana, church groups, schools fundraisers and kind random strangers from almost every state are pitching in to make sure a good portion of the 1.56 million homeless Americans are a little warmer this winter! A bit of good news in this most difficult of months following the elections. A fuller version of this heartwarming little story can be found on Facebook or at HeartlandEternal.com. Going down right now to my stash of handknits to find a couple to share.